For many years people heard how much healthier it was to eat your meat on the grill. The grill allows the fat to drip away leaving you with a learner piece of meat. People that love the grill ate it because it gives the meat a more unique and natural flavor. Then, all of a sudden, reports started coming out that said that grilling your meat may kill you. The culprit seems to be pointing towards both charcoal and gas grilling, and it comes from studies that the fats when combined with the high, direct heat of the grill, are creating heterocyclic amines (HAs). HAs are possibly carcinogens, and can increase risk of developing certain types of cancer. Don’t let cancer scare you from having a great summer with lots of goodies on the grill. There are things that you can do to make your meat safer. Instead of putting your meat directly on the grill, wrap it in foil first. This keeps the fats from dripping into the fire and creating those nasty carcinogens, and it may even give you a juicer piece of meat. If you’re worried about too much fat in your meal just pick leaner cuts of meat to begin with, which are the healthier option anyway. Just because you are wrapping your food doesn’t mean you shouldn’t clean your grill before cooking. The burning meat and fat leftover on your grill can also produce those cancer causing agents, so it’s important to keep your grill clean. If wrapping your meat in foil feels as though you may be blocking out those delicious grill flavors, there is another option for you. Instead of wrapping your meat in foil wrap it in marinade. 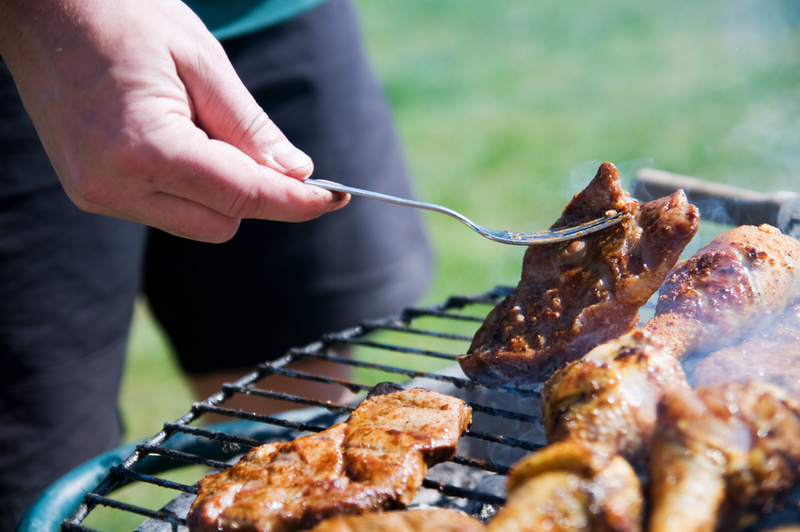 Although they haven’t yet figured out exactly why yet, it seems that marinades help protect the meat from carcinogens. Marinating your meat opens you up to more possibilities with your food too. You can experiment and try out different flavors. You never know, you may come up with something amazing. No matter what you are cooking on your grill, the most important rule is to not burn it. It is in that charred piece of food that cancer causing organisms could be hiding. If you are concerned about burning, keep your flame lower. You shouldn’t be burning your grilled food anyway because it defeats the purpose of grilling. Instead of getting a tasty piece of food with that wonderful grilled taste you get a charcoal brick that no longer tastes like anything but burnt food.